सिस्टम यूनिवर्सल डी डॉकुमेंटेशन या SUDOC is a system used by the libraries of French universities and higher education establishments to identify, track and manage the documents in their possession. The catalog, which contains more than 10 million references, allows students and researcher to search for bibliographical and location information in over 3,400 documentation centers. 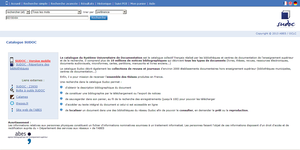 It is maintained by the Agence bibliographique de l'enseignement supérieur.